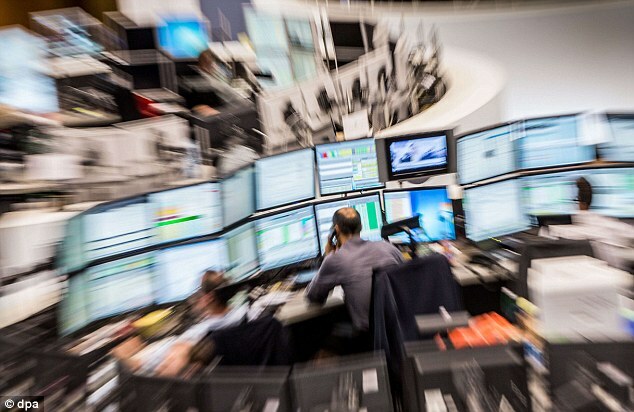 The surging UK jobs market created another record last night as the FTSE 100 closed at a record high. The index ended the day up 53.77 points at 7787.97, nearly ten points clear of its previous closing record of 7778 on January 12. Stocks were also bolstered by the rise in the price of a barrel of oil, as it topped $80 for the first time in nearly four years, amid the prospect of a cut in supply from sanctions-hit Iran. The Bank of England’s decision to postpone an interest rate rise because of falling inflation and a dip in unemployment has also helped the markets’ strong showing, experts said. Rising oil prices lifted Shell 2 per cent, or 53p, to 2730p, alongside rival BP, which closed up 1.4 per cent, or 8.1p, at 584p. Bookmakers also had a strong day despite the crackdown on ‘crack-cocaine’ betting machines. Shares were up even as ministers backed slashing the maximum stake on lucrative fixed-odds betting terminals from £100 to £2. The industry battled against the change, and yesterday continued to warn of shop closures, profit cuts and damage to sports such as horse racing. But investors appeared to think those worries were overblown, or had already priced them in. 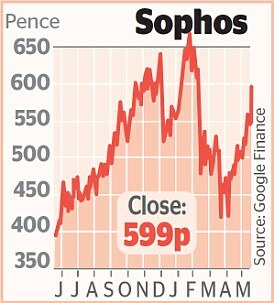 Investors were thrilled as Oxford cyber-security firm Sophos yesterday unveiled a 21 per cent rise in sales to £474million. Demand for its services is soaring on the back of a string of global cyber attacks. Analysts at Stifel are among many with a ‘buy’ rating on the stock. They said it could also benefit from the row around personal data triggered by allegations about Facebook. Shares have more than doubled in price since 2015. Yesterday they rose 8.9 per cent, or 49p, to 599p. GVC Holdings, the owner of Ladbrokes Coral, said it will face a £160million hit from the decision and will now identify stores to shut. Shares rose 5 per cent, or 45.5p, to 961p. Paddy Power Betfair warned of a £46million revenue hit but said there would be no material impact on its retail strategy. Shares rose 1.9 per cent, or 155p, to 8405p. And William Hill claimed the decision will mean 900 stores become loss-making and at risk of closure. But shares rose 4.2 per cent, or 13.3p, to 330.8p. The gains capped a strong week for the industry, with shares rocketing on Monday after the US freed states to legalise sports betting. Financial services firm Just Group also rose as it announced a 43 per cent hike in quarterly retirement income sales to £454million. Business was boosted by its management of company pension schemes. Sales of bulk annuities – insuring company pension schemes – rose 99 per cent to £249million. The market is booming as many defined benefit schemes are in deficit and companies want to pass on the risk. Analysts at Numis said the trading statement was ‘exceptionally strong’ and noted Just Group has limited competition. Shares rose 7.1 per cent, or 10p, to 150.4p. Upmarket tonic maker Fever-Tree lost some of its fizz, sinking nearly 6 per cent after it said it was trading in line with expectations. That wasn’t good enough for some investors in a firm known for staggering growth. Shares fell 5.7 per cent, or 168p, to 2757p. It wasn’t all gloom, however: analysts at Shore Capital said AIM-listed Fever-Tree still has significant opportunity, with growth expected from the US. Investec reiterated its ‘buy’ recommendation on the stock, noting efforts to roll out lighter versions of products due to the sugar tax in the UK. Also on AIM, Igas, one of the UK’s largest onshore oil and gas producers, had an early bump after a statement by Business Secretary Greg Clark backing fracking. He and Housing Secretary James Brokenshire said the statement should be considered when planning decisions are made. Igas has licences to explore for shale gas and is among several firms hoping to start fracking in the UK. Government backing failed to excite investors, however: Igas rose in early trading but had fallen by the end of the day. The shares closed down 1.2 per cent, or 1p, at 85p.